One of the most versatile and helpful all-around tools to have in your DIY arsenal is a cordless drill. With a cordless drill, you can work on a variety of personal and professional projects without having to worry about the location of a power outlet or tripping over your power cord. A cordless drill is perfect for building carpentry projects from the ground up or for installing shelves and wall décor. 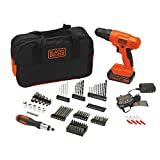 In order to help you purchase the best cordless drill, we have reviewed popular drills found on Amazon.com. In our cordless drill reviews, we have taken an in-depth look at the features of various popular drills. Here’s what you should be looking for in a new cordless drill. These are just a few of the areas we cover in our reviews. Size and Heft. You want your cordless drill to be as lightweight and compact as possible. This improves performance and also makes the drill easier to handle. Good balance is essential in a drill. Lithium-Ion Batteries. This is not to say that all drills with nickel-cadmium or nickel-metal batteries are bad drills. They are less expensive than the lithium-ion-powered models, but you will get better performance from the lithium-ion drills. We also take a look at recharge time. The faster the better, of course. Accessories. Also look for a battery gauge that lets you know when it is time to recharge your batteries. An LED light can also help you see what you are doing when you are working in corners and other spaces where visibility is low. The best cordless drills may also include additional tools, such as a circular or reciprocating saw. Specialization. Sometimes cordless drills have specialization features. For example, a cordless drill may be designed to be ultra-compact and fit in your pocket. Others are designed for purposes such as drilling through concrete (hammer drills—more on that later). You will need to think about the projects you plan to use your drill for to figure out which type of drill you need. For general purpose projects, general purpose drills usually offer the best performance at the best price. Black and Decker Tools has some excellent options for lower-cost cordless drills. 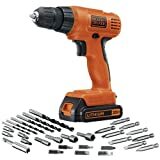 The Black and Decker drill LDX172C 7.2-Volt Lithium Drill/Driver retails for around $20-40, and includes a lithium-ion battery, a 3/8 inch chuck, and a comfortable grip. This is a perfect option for DIY projects. For around $50-$60, you can purchase the Black & Deck GCO18SFB 18-Volt Ni-Cad 3/8-Inch Cordless Drill/Driver, with Stud Sensor & Storage Bag. 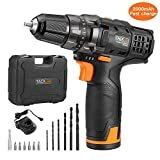 Two more to consider are the Black & Decker BDCDMT120 20-Volt Matrix Drill and the Black & Decker LDX120C 20-Volt MAX Lithium-Ion Drill/Driver. Bosch Tools manufactures a wide range of cordless electric drills as well. At $100-$150, the well-liked Bosch DDB180-02 18-Volt Lithium-Ion 3/8-Inch Cordless Drill/Driver Kit with a charger, 2 batteries and a case is a great deal. For a Bosch drill at the upper end, tools like the Bosch 38636-01 36-Volt Litheon Drill/Driver with 2 Compact Batteries offer top-notch performance at 36 volts. We also recommend the Bosch PS31-2A 12-Volt Max Lithium-Ion 3/8-Inch 2-Speed Drill/Driver Kit with 2 Batteries, Charger and Case, and the superb Bosch DDS181-02 18-Volt Lithium-Ion 1/2-Inch Compact Tough Drill/Driver Kit with 2 High Capacity Batteries, Charger and Case. When you are shopping for a DEWALT cordless drill, you will find a huge range of tools including driver drills, hammer drills, rotary hammer drills, and right angle drills. Voltage ranges from 12 volts up to 20. The DEWALT DCD780C2 20-Volt Li-Ion Compact Drill Driver Kit is a particularly popular purchase that prices in around $130-$180. 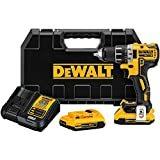 A less expensive option in the $80-$100 price bracket is the DEWALT DC970K-2 18-Volt Drill/Driver Kit. Between these prices, you will find the DEWALT DCD710S2 12-Volt Max 3/8-Inch Drill Driver Kit. Another one to consider is the DEWALT DCD760KL 18-Volt 1/2-Inch Cordless Compact Lithium-Ion Drill/Driver Kit. In need of a hammer drill? Take a look at the DEWALT DCD985L2 20-Volt MAX Li-Ion Premium 3.0 Ah Hammer drill/Driver Kit. Need something compact? The DEWALT DC720KA Cordless 18-Volt Compact Drill/Driver may be exactly what you are searching for. 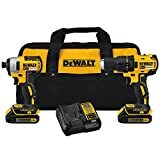 Alternately, consider the DEWALT DCK286D2 20V Max XR Lithium Ion Brushless Compact Hammerdrill and Impact Driver Combo Kit. Another great kit is the DEWALT DCD771C2 20V MAX Cordless Lithium-Ion 1/2-in Compact Drill Driver Kit. Also take a look at the DEWALT DCF610S2 12-Volt Max 1/4-Inch Screwdriver Kit. 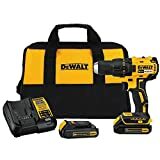 Other great DEWALT drill kit options in the $120-$180 price range are the DEWALT DCK210S2 12-Volt Max Screwdriver/Impact Driver Combo Kit and the DEWALT DCK211S2 12-Volt Max Drill/Driver/Impact Driver Combo Kit. 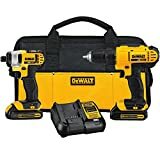 Two additional excellent DEWALT drill choices worth considering are the DEWALT DCK280C2 20-Volt Max Li-Ion 1.5 Ah Compact Drill and Impact Driver Combo Kit or alternatively the DEWALT DCK281D2 20V Max XR Lithium Ion Brushless Compact Drill/Driver & Impact Driver Combo Kit $220-$270. 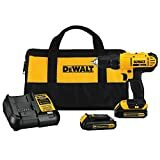 If you are looking for an outstanding hammer drill and impact combo kit then it is worth investigating the highly rated DEWALT DCK290L2 20-Volt MAX Li-Ion 3.0 Ah Hammer Drill and Impact Driver Combo Kit, and the DEWALT DCK296M2 20V XR Lithium Ion Brushless Premium Hammer Drill and Impact Driver Combo Kit, which are currently averaging 4.7 stars each from customer reviews on Amazon.com. These DEWALT drills offer great value for money. 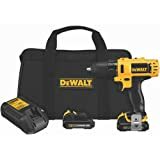 While shopping for a DEWALT cordless drill kit, also have a look at the DEWALT DCK285C2 20-Volt MAX Li-Ion Compact 1.5 Ah Hammer Drill and Impact Combo Kit that sells for around $200. DEWALT cordless drills are some of the most popular options out there for home users and professionals and are among our most highly recommended drills. Genesis Tools has some great mid-price options, including the Genesis GCD18BK 18V Cordless Drill Driver Kit, Grey, Heavy Duty. This set includes the tool itself, the drill bits, the battery and charger, and a carrying case, all for around $30-$60. Genesis is also known for some of their specialty drills, like the Genesis GLSD72A 7.2V Lithium-Ion 2-Speed Screwdriver Grey, which sells in the $25-$35 price range. A Hitachi drill is a great option if you are looking for an affordable drill for a DIY project. Many Hitachi drills are priced around $60-$140, and run at 12 to 14 volts. Powered by lithium-ion batteries, these Hitachi tools offer excellent performance at a reasonable price. If you are searching for a popular Hitachi cordless drill have a look at the Hitachi DS18DSAL 18-Volt 1/2-Inch Drill/Driver for example, or the Hitachi DS18DVF3 18-Volt Ni-Cad 1/2-Inch Cordless Drill/Driver Kit. If you are looking for a high performance drill from this brand you should check the highly rated Hitachi DS18DL 18-Volt Lithium-Ion 1/2-Inch Cordless Driver Drill that costs around $260. Makita Tools creates a number of specialized cordless drills. 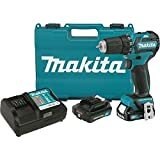 If you are looking for a hammer drill, the Makita BHP454 18-Volt LXT 1/2-Inch Lithium-Ion Cordless Hammer Drill Kit is a great choice, available for around $340-$370. A good lightweight Makita cordless drill option is the Makita 6280D 14.4V Cordless 3/8” Drill. 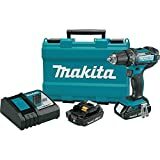 An excellent Makita drill designed to be small and light is the Makita FD02 3/8 inch 12 Volt Lithium-Ion Drill, which costs around $30-$40. Another great compact choice from the Makita drills selection is the Makita LXFD01CW 18-Volt Compact Lithium-Ion Cordless 1/2-Inch Driver-Drill Kit. Milwaukee Tools has a number of cordless drills in their product line at a variety of prices. 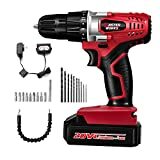 At the lower end of the price scale are the compact length (7-3/4 inches) Milwaukee 2601-20 M18 18-Volt Compact Driver/Drill and the faster and more powerful Milwaukee 2602-20 M18 18-Volt Cordless 1/2-Inch Hammer Drill/Driver, available for around $60-$110. These highly rated Milwaukee drills are powered by a lithium-ion battery and run at 18 volts. Available at the middle range of the scale between $110-$220 are the popular Milwaukee 2401-22 12-Volt Li-Ion Compact Driver Kit with 150 in.lbs of torque and a speed of 0 to 500 rpm; and also the Milwaukee 2410-22 M12 12-Volt 3/8-Inch Drill/Driver with higher torque and speed. Both these great cordless drills are powered by a 12 volt Lithium-Ion battery. 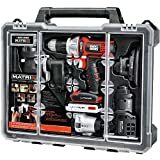 Also have a look at the Milwaukee 2601-22 18-volt Li-ion Compact Drill Kit that comes with one drill tool, a 30 minute charger, two 18 volt Li-ion batteries and a carrying case. At the very upper end of the scale around $220-$320 is the excellent Milwaukee 2603-22CT 18V Cordless M18 FUEL Lithium-Ion Drill Driver which delivers up to 650 in-lbs of torque. Moreover a great Milwaukee cordless drill kit to consider in that range is the Milwaukee 2601-21 M18 Red Lithium 18-Volt Cordless 1/2 in. This is a compact drill kit which comes with one drill, a 30 minute charger, one 18-volt Li-ion battery and a carrying case. Another exceptional Milwaukee drill kit at that range that offers greater torque and higher drill speed is the Milwaukee 2602-22 M18 18-Volt Cordless 1/2-Inch Hammer Drill/Driver Kit which includes, one hammer drill, 1-Hour Charger, two M18 XC High Capacity Lithium-Ion Batteries and a Kit Box. Looking for another low-cost option? The PORTER-CABLE PCL120IDC-2 12-Volt MAX Compact Lithium-Ion 1/4-Inch Hex Impact Driver is available for around $80 If you are shopping for something compact. This lithium-ion powered PORTER-CABLE drill provides powerful performance at a low price. 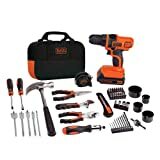 You may also be interested in the $70-$90 PORTER-CABLE PC180DK-2 18-Volt NiCd Drill/Driver Kit. 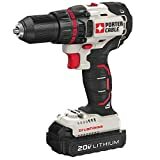 In between these prices, you will find the PORTER-CABLE PCL120DDC-2 12-Volt Max Compact Lithium-Ion 3/8-Inch Drill/Driver, which is a highly rated PORTER-CABLE cordless drill. 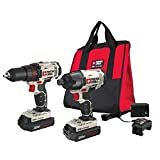 Two exceptionally good drill kits from this brand are the PORTER-CABLE PCCK600LB 20-volt 1/2-Inch Lithium Ion Drill/Driver Kit and the PORTER-CABLE PCCK602L2 20V MAX Lithium 2 Tool Combo Kit, which sell for around $120-$170. If you are looking for a hammer drill then you should consider the excellent PORTER-CABLE PC18CHD 1/2-Inch 18-Volt Hammer-Drill or the PORTER-CABLE PC180CHDK-2 1/2-Inch 18-Volt NiCD Compact Hammer Drill Kit. Ryobi Tools cordless drills are the most cost-effective drills out there, and are ideal for hobbyists and home users. Many of their drills are available for around $40-$60, like the Ryobi P271 18V ½” Li-Ion One+ Cordless Drill. Used, you can find Ryobi cordless drills for around $15-$30. You will find a wide price range for SKIL Tools cordless drills, and a wide selection to boot. One mid-price choice is the SKIL 2364-02 7.2-Volt Lithium-Ion Drill/Driver, which is available for around $35-$55. A more expensive choice is the SKIL 2260-01 18-Volt 3/8-Inch Drill/Driver Kit. This kit sells for around $50-$70. A slightly better rated one at $70-$100 price range is the SKIL 2898LI-02 18-Volt Li-Ion Drill/Driver Kit. What else should you know about cordless drills before you start shopping? First off, a word on cordless impact drivers. These are specialized tools which are great if you need to do some seriously heavy-duty work, but if you are a DIY hobbyist looking for something basic to do simple, standard projects, the impact drill will be overkill for what you need. Likewise, you do not need a cordless hammer drill unless you are actually planning on driving through concrete or brick blocks. For standard materials like wood planks, you really do not need a hammer drill. It is advisable to shop for cordless drills in person. You do not need to actually make your purchase in a brick-and-mortar shop. 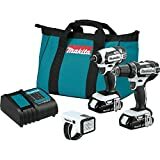 Many of the best cordless drill prices are on Amazon.com. It is a great idea though to drop by a local hardware shop, and pick up a few of these drills to get used to their weight and heft and get a feel for what you are shopping for. Write down the names of some of the brands you are most interested in, check out our reviews, and then look for the best deals online. You also may want to consider buying a cordless drill combo kit instead of purchasing all the components separately (the charger and batteries). A drill combo kit will usually offer you a discount for purchasing everything in one package. Now that you know more about cordless drills and what you are looking for, check out our cordless drill reviews! Product prices and availability are accurate as of November 26, 2018 03:06and are subject to change. Any price and availability information displayed on the Amazon site at the time of purchase will apply to the purchase of the products above.